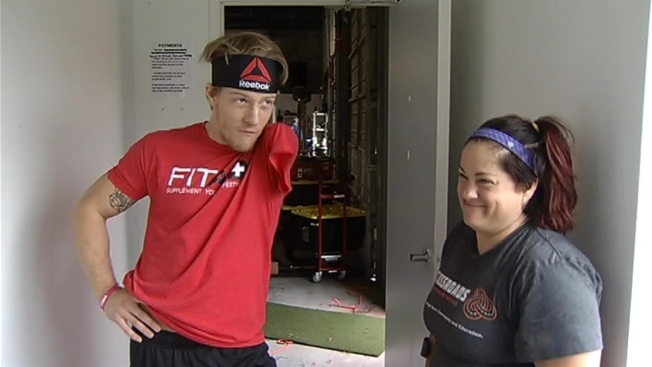 There was no shortage of sweat equity at the Cross Fit gym in Lorton on Saturday as part of the fourth annual Working Wounded Games, sponsored by Crossroads Alliance. Some of those working out on this day were in it for more than just fitness of body. They were working on their minds and their souls as well. Some have lost limbs in the theater of war, some are civilians who've had accidents or were born with challenges, but all came to the games to sweat. When retired U.S. Army Capt. Mark Little began recovery from his war wounds, competition was the farthest thing from his mind. "But as soon as I got linked up with CrossFit, in general, my physical fitness and health improved,” Little said. United States Navy explosive ordnance disposal technician Scott Weaver found the games as a way back from a darker place. "You think everything's gone. You can't do that anymore,” Weaver said. “I heard about Working Wounded Games while I was in the hospital in bed, and it just gave that little spark." For some of those new to adaptive athletics, the spark needs a little stoking to become a flame. But there's the sharing of experiences, reinforcement and humor, and soon, they’re carrying their own weight and some. "So happy to be here,” said Logan Aldridge. “Can't stop running around and talking to people"
Scott Rigsby was the first double amputee to finish the Hawaiian Ironman triathlon. He's a civilian in life but a veteran of these games. "It's great,” Rigsby said. “I was here when we had 20 people. Now, we have almost 90 people." "The word athlete has to come first. The word adaptive should come second,” said co-founder David Wallach. “These are athletes." Some of their challenges are not outwardly visible, like post-traumatic stress disorder or traumatic brain injuries, but the healing that comes with the games is clear, inside and out. "Sharing this experience is probably one of the two days a year that I cry, seeing my fellow brothers and sisters out there, giving it all they got,” Little said.